I recently wrote about the password crisis and growing support of new biometric solutions, such as our Fast IDentity Online (FIDO). For the financial services industry, having a secure, simple, and user-friendly authentication method is no longer a nice-to-have, but a necessity. Fortunately, the industry is heeding the call. According to a recent IDG Research Services survey of executives in the financial services and insurance industries, some firms have already adopted biometrics while others indicate they are looking to implement in relatively short order. Given the high cost of managing passwords for both employees and customers, most of the executives surveyed by IDG believe biometric-enhanced security is practical now, or will be in the near future. In fact, some banks have already begun using embedded mobile device finger scans, and others are looking to deploy facial, voice, and iris recognition to bypass the use of passwords. However, confidence in existing security infrastructures, most prevalent being the use of password authentication, still exists. Not surprising given the industry’s tendency to think, ‘If it isn’t broken, don’t fix it.’ Unfortunately, traditional password authentication approaches the level of current security risks. Verizon’s annual Data Breach Investigations Report found that 63% of confirmed data breaches involved the use of weak, default, or stolen passwords. Fortunately, even if IT and security teams are not motivated to make the change, internal champions are pushing for the use of innovative technologies to better meet the needs of customers and provide the organization with a competitive edge. Newer methods—including one-time password tokens, smart cards, and digital certificates—are being considered, but the required system changes and subsequent high costs make them less attractive. Executives surveyed are most interested in biometric authentication for mobile banking and payments, with the majority (74%) believing it viable for their firms in two years or less. 24% of these believe it to be an immediate reality. The overwhelming support is not surprising, as users today are increasingly accustomed to performing a variety of banking functions with their phones. And, with an estimated 600 million biometric-equipped mobile devices currently in use (accounting for about 28% of smartphones in use globally, according to Acuity Market Intelligence), adoption of biometric authentication by customers will be fast. Is your company prepared to offer customers and employees biometric authentication? Contact us today to learn how our Fast IDentity Online (FIDO) Biometri solution can support your business goals. 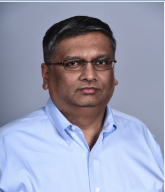 Shankar Saibabu is the lead Solutions Architect and FIDO Standard Specialist for the Financial Services Team at Samsung SDS America. Shankar has various experiences in regulated industries when it comes to software solutions and services, including the healthcare industry.